I am jyan i am from kurdistan . The IELTS coaching at Let's Talk is designed to give you in-depth and careful preparation for all aspects of IELTS. IELTS assesses all of your English skills — reading, writing, listening and speaking, and is designed to reflect how you will use English at study, at work, and at play, in your new life abroad. The IELTS test is developed by some of the world’s leading experts in language assessment. It has an excellent international reputation and is accepted by over 9,000 organisations worldwide, including schools, universities, employers, immigration authorities and professional bodies. IELTS is the most widely accepted English language test that uses a one-on-one speaking test to assess your English communication skills. This means that you are assessed by having a real-life conversation with a real person. This is the most effective and natural way of testing your English conversation skills. You can take IELTS Academic or IELTS General Training – depending on the organisation you are applying to and your plans for the future. Whatever your reason for taking IELTS, make the most of your language skills. Our IELTS coaching for IELTS exam preparation course will prepare you for the IELTS (International English Language Testing Systems) test. This is a test you need to study or work where English is the language of communication. IELTS scores are recognised by universities and colleges, employers, immigration authorities and professional bodies. British universities and other centres of education generally require IELTS level 6.0 or higher as evidence of language ability. Let’s Talk Institute for IELTS coaching and training is proud to have an excellent IELTS exam success rate. We recommend a minimum course duration of 4 weeks, although shorter is also possible. The IELTS examinations registrations are done in house at our centre as we are a registered British Council enrollment centre If you want to do the IELTS exam at the end of your course, please make a note on the enrollment form. Unlike other institutes who do not register students for the IELTS exam, we have a one-stop solution for your IELTS goal. With over 10 years IELTS training experience, our team have developed a unique 3-Step system to ensure you are learning effectively and efficiently. Our 3-Step program has helped IELTS candidates identify errors they have previously made and to improve their skills in all areas, and provides a logical and clear way of learning to reach the best IELTS score/band you need in the quickest possible time. Complete interactive lessons. 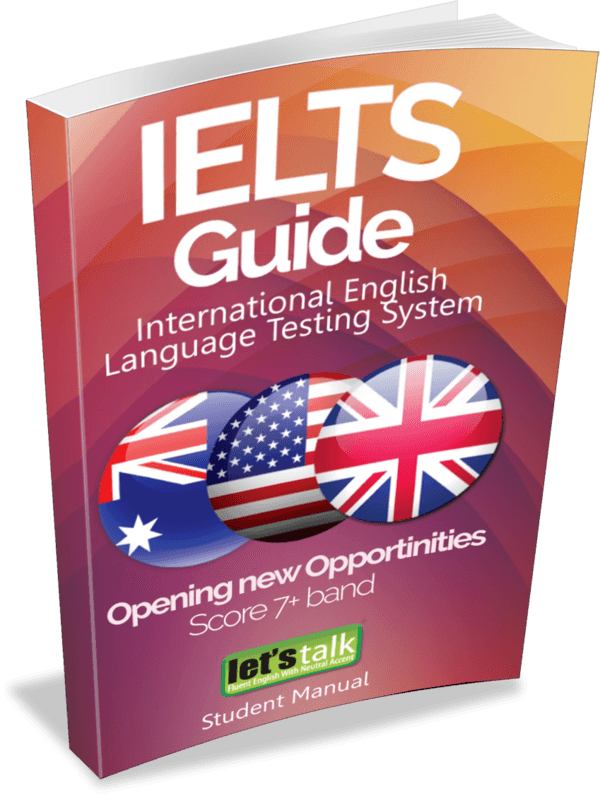 In this step, you will be guided to every part of the IELTS test, from how to handle each question type to the best strategies to use on test day. All lessons are supported with practice exercises and full feedback and will help you build all the skills you need to get the IELTS result you’re aiming for. End of lesson tests. Once you have worked through the pre-lesson vocabulary in Step 1 and the interactive lesson in Step 2, you can then move on to Step 3, where you will take a practice test or exercises focussed specifically on the topic you have just covered. This is essential to help you consolidate your skills and practice using them in an IELTS test environment. Easy to understand IELTS course material. ​Student courseware contains advice, exercises and practice tests for the four components of the test: Listening, Reading, Writing and Speaking. It covers both IELTS Academic and IELTS General Training.